Angels Camp is perfectly situated at about 1,400 feet elevation, which keeps it above the valley fog and below most of the winter snow. The summers are resplendent with blue skies and warm weather. 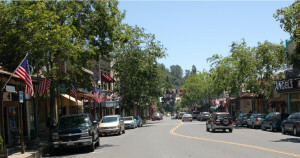 The town has kept the allure of the Gold Rush era alive with many of the 19th century buildings housing great eateries and unique shops. In fact, visitors today can shop in the old Angels Hotel building where back in 1865 a young Samuel Clemens (Mark Twain) hung out at the tavern there and heard the amazing tale of the jumping frog “Dan’l Webster”, and became internationally famous with his tale The Celebrated Jumping Frog of Calaveras County. Today, the housing in Angels Camp is a charming mix of well-maintained Victorian homes, newer neighborhoods and larger homes on acreage. The community envisions the development of affordable housing near areas of employment and a mix of combined residential and commercial buildings in the downtown area. Angels Camp officially became the City of Angels when it was incorporated in 1912. The only incorporated city in Calaveras County, Angels Camp elects its own mayor and city council, has its own police, fire, water and wastewater departments and maintains the city’s roads and other services.